This is Mercenaries IV, a painting that is not part of this court case in New Hampshire. An expert on Leon Golub’s work, Professor Jon Bird of Middlesex University in London, testified Wednesday that the paintings in question appear to be made with the wrong materials, and weren’t painted in Golub’s signature style. With the guidance of Hall’s attorney, Bird walked through each of the 17 paintings in question. Bird explained how Golub’s early works relied on the application of a specific type of lacquer, pointing out that the same material didn’t appear to be present in these works. He also described Golub’s process of applying acrylic paints, then scraping away at some of the paint, before applying another layer. 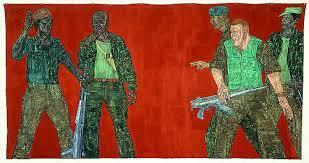 The result was a distressed or “pitted” surface that marks a true Golub painting. “It’s wrong, it’s all wrong,” he said describing one of the works that Hall purchased from the Gascards. Bird also said the figures in the paintings, which often involved scenes of torture and brutality, didn’t appear to have the same level of understanding of human anatomy that Golub employed. He questioned the use of text in one image, and said the works on canvass affixed to a stretcher were also red flags. “An accumulation of inaccuracies,” said Bird. On Thursday, Bird will be cross-examined by Gascard’s lawyers. He is expected to be the final witness in a trial that kicked off Monday with testimony from Hall and both Lorettann and Nikolas Gascard. The Gascards testified that they were friends of Leon Golub, and that other relatives acquired his paintings over the years. They say these paintings are authentic, and were found rolled up in an apartment in Germany in the home of Nikolas’s aunt. After shipping them to New Hampshire, Nikolas admits he created titles and years of creation for the paintings before he began selling them through auction houses, including Christie’s and Sotheby’s. Hall, who already owned other Golubs, began purchasing works from the Gascards in 2011. He was told by Nikolas that Lorettann was a student of Golub in the late 1960s, and that they maintained a friendship until his death in 2004. Hall testified that if he had been told of the paintings' alleged origins in an apartment closet, and the names conjured by Nikolas, he never would have purchased the paintings. He’s seeking more than $500,000 from the Gascards. The jury is expected to begin deliberations on Thursday. Jury selection begins Wednesday in the strange case of a New Hampshire mother and son accused of selling forged art works to a prominent collector. Lorettann Gascard and her son Nikolas are accused of selling two dozen forged works by the painter Leon Golub to Andrew Hall. Gascard is a former art history professor at Franklin Pierce University in Rindge. She claims she was a student of Golub in the 1960s.